Fantasy Flight’s A Game of Thrones: The Board Game is a fantastically executed area control game wherein each player takes on the role of one of six houses and attempts to conquer the continent of Westeros. The game encourages the sort of bargaining, power brokering, bluffing and backstabbing that you’d expect from the A Song of Ice and Fire series. Mechanically, the game looks a lot more complex than it actually is, and once players get the hang of the orders system (which I like), the game is a breeze. I also like the combat system, allowing you to stack the combat in your own favour, but then introducing some uncertainty in the character cards. Good stuff! As with most Fantasy Flight games, the production quality is great with cool little tokens for military units and beautiful artwork on the board and cards. It just looks good on the table and that makes moving your little armies around all that more satisfying. The smallest game that Vlaada Chvátil has put out, Codenames is a unique and engaging little word game. In this game (assuming 4 players), players split into two teams of two. One team member has a coloured grid card of 25 squares, corresponding to 25 word tiles on the table. They must get their team-mate to guess all of the blue-coded words, whilst the other team must guess all of the red ones. This is done by giving a one word clue along with the number of words that this clue could apply to. For example, if I were hinting at the words ‘rough’, ‘tree’ and ‘dog’, I might say ‘Bark, three’. The first team to get all of their words wins. Every group I’ve played this with has loved it, though I do make slight changes when playing with small children, encouraging them to hint at one word at a time rather than multiple ones. There are now a few editions of the game including the original edition, an adult-themed edition and a popular picture-based edition. This game was a huge hit and all of that attention and hype was most definitely earned. I grew up on Games Workshop’s miniatures games, including Warhammer, Warhammer 40,000, Blood Bowl and Mordheim. These games are fine, but all of them – even my beloved Blood Bowl – are quite clunky and rules-heavy for what they are. Both Warhammer and Warhammer 40,000 are also just so big – well, Warhammer was until Age of Sigmar landed. The model counts that these games now require would be far more appropriate at a smaller scale in games such as Dropzone Commander or similar. Malifaux is a low model count skirmish game, and is one of the best miniatures games that I’ve ever tried. The rather disparate, hodge-podge theme puts some people off, as it encompasses steampunk, Victorian horror, comedy, Lovecraftian horror and cowboys, as well as whatever else the designers decide to chuck in. I like it, though! I love that different crews can feel and look and play so differently. The game’s gimmick is the lack of dice. Instead, you use a deck of regular playing cards and, from that, a hand of cards that is at your disposal throughout your turn. You play flip cards from the deck in place of rolling dice and can ‘cheat’ out a card from your hand to replace the flipped card if you wish to. This system works really well and is also employed in the Malifaux-based RPG, Through The Breach. For me, this game just flows well, is fun, and has a cool dynamic with the cards. You can read my thoughts on this game in previous posts. Like Love Letter, Coup could be described as a microgame, relying on only a few cards and a handful of tokens. This accessible little game is one of social deduction and I did spend some time swithering over whether Coup or The Resistance should be higher in my list, but ultimately, I would reach for Coup with a bigger range of groups and I find Coup more interesting at the moment. In Coup, you are given two cards which give you powers you can use to try to eliminate the two cards of each other player. The thing is, the powers you get are hidden, as nobody else can see your cards. This means that you can actually use whatever power you want and just claim to have that card. Brilliant. But don’t get caught, because then you will lose one of your two cards! Similarly, don’t be too quick to accuse someone of telling fibs, as a false accusation will cost you one of your own cards. The game flows really well and is best described as being an elegant design. I picked up the Revised Edition of Vampire: The Masquerade in the late 90s from Megazone in Falkirk. For years, I held onto the book, poring over every description and snippet of fluff and story until I knew it inside out. It was a fantastic book for me, but it was not truly a game until two or three years ago when I finally, finally, finally got to actually play it. And not just play, but run a game as storyteller. 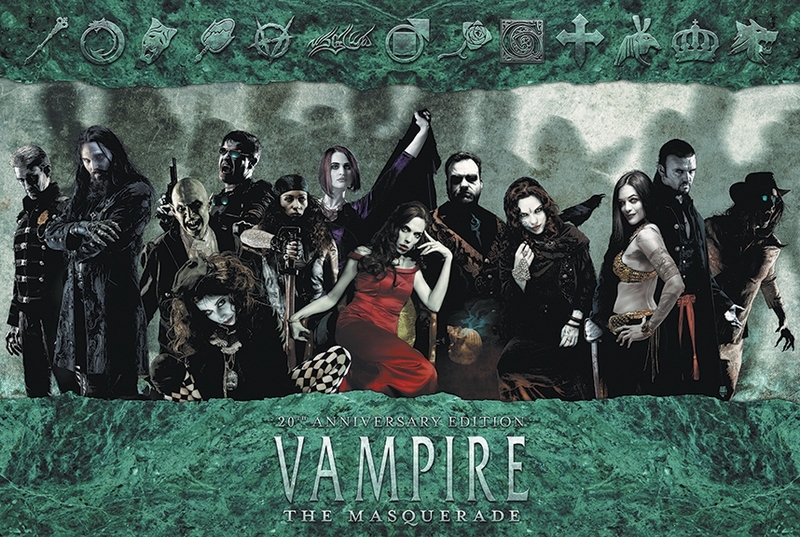 The system used for Vampire: The Masquerade and the wider World of Darkness is really solid and flexible for making lots of very different types of characters. That’s important to me. It’s also easy fudge if you want something specific to happen in your games that is not quite covered in the rules. That is also important to me. The system is also really good for being relatively unobtrusive in most cases – certainly more so than D&D and other games of a similar weight, allowing the game itself to get out of the way in favour of story. This is vitally important to me. V:tM is known for its rich back story and metaplot, as well as the wide array of options available to players, making it easy and entertaining to play in the work that White Wolf gave us. This is a fantastic example of horror gaming and, until this year, it would have had the distinction of serving as the highest RPG on my list. It is close second to the game this did clinch this title, and in another year, with another great campaign under my belt, it may rise even further. A true classic of the genre, this one. Although I’m writing about the 2008 Fantasy Flight edition, Cosmic Encounter has actually been around since the original Eon Games edition from 1977. I myself have a copy of the game which was printed by Games Workshop in 1986. Fundamentally, Cosmic Encounter is s negotiation game. You take on the role one of several (read: MANY) alien races with the goal of establishing 5 foreign colonies. To do this, the player launches an attack on one of another player’s planets, committing a number of their ships to the attack. Both sides can then call on others to ally and add more ships to either the attack or defence. Once the forces are aligned against one another, the active players then each choose an action card – an attack or a negotiate. If both players choose negotiate, they have a minute to come to an agreement to resolve the conflict. If one chooses and attack and one chooses negotiate, then the attacker automatically wins, but will pay war reparations to the loser. Finally, if both choose to attack, the number on the attack card is added to the number of ships the player’s side has in the combat. The higher number wins and the enemy ships are banished to the warp. This is the simple core of the game. The complexity and fun the game comes with the unique powers of each of the alien races. Each individual race breaks the game in different ways. The parasite, for example, can force itself into any team during a conflict, with or without the permission of the active players. The Loser switches the combat system around so that the lowest number wins the combat, rather than the highest. There are, once expansions are taken into account, a couple hundred aliens, giving a huge variety of potential matchups. To me, this makes the game endlessly entertaining and replayable. In terms pf accessibility, the core rules are easy to explain, but the complexity and interactions between alien powers can be difficult for some new players to pick up, as are the functions of the some of the cards. It’s not a gateway game, but I just love it. Twilight Imperium is a truly massive game. An epic game of space conquest, the board is a huge, modular map of the galaxy for you to conquer. Each player controls a civilisation with a lot of cool ship and troop miniatures to move around the map. The scope of what you are trying to accomplish is, likewise, just massive. You have responsibility for warfare and conquest, yes, but also diplomacy, research and development, construction and trade. So, yeah, big – and even more so with the two large expansions. This is a game that is difficult to get onto the table. I’ve only managed to play it twice, but I have massively enjoyed it both times. The time estimate above is quite optimistic, especially for a first game or a game with more than one or two new players. I want to get this onto the table a couple more time over the coming year, as I do love the massive scope of it and the sheer amount of stuff for you to keep on top of. On a side note, given that this is Fantasy Flight’s big, flagship game, I’m surprised we’ve not seen a shrunken down new edition like we saw for Descent. But then, they’re kinda busy dicking around with the Star Wars license these days. This is really a listing for two games: The Dresden Files Roleplaying Game is the main title I’m looking at, but also the FATE system on which it is based. The Dresden Files series of novels by Jim Butcher are all based around the character of Harry Dresden, the sort of cool, hardass private investigator you’d expect to find in a Raymond Chandler novel. ‘Cept that he’ also a wizard. Yeah, I love those books. So, thematically, this is already a winner for me, but the system itself is also great. FATE is such an accessible system, taking out a lot of the annoying arithmetic you get in many titles and replacing it with a simple ladder system where you move up and down based on pluses and minuses on a special D6 and define the feel of your character using short phrases known as ‘aspects’ which you come up with yourself and which are them represented mechanically in the game. The system is easily adaptable for just about any setting – indeed many different type of game use FATE as their engine. The Dresden Files Roleplaying Game is based on the third edition of Fate, but in the near future I’d really love to run a game of the fourth edition FATE Core, using Terry Pratchett’s Discworld as the setting. I’ve only run one campaign of this so far, but i loved how the system worked and how the setting was developed and explained and explored in the books. I also really appreciate how beautiful the books are, really making them desirable objects in their own right. This deserves to be highest rated RPG in my list this year and I hope to further explore this system in the coming year. This is quite a serious game for me. No dragons? No space ships? A footing in actual history? Twilight Struggle is an area control game that replays the events of the Cold War. One player takes on the role of the USSR against the other player’s USA. Each player works to spread their influence, trying to gain control of countries, regions and prized battlefield states whilst minimising the efforts of their opponent and working to avoid thermonuclear war. Cos, you know, that’s really bad. Long one of the highest rated games on Board Game Geek, Twilight Struggle is a game that looks far more complex than it is, but after your first couple of plays, it really flows rather well, especially when you’re using the excellent summary card that comes in the box. It’s one of these games that are quick to learn, but hard to master, as demonstrated by the utter trouncing I get whenever I try to play it online. I’ve managed to get loads of games of this in this year, which has just been fantastic. My current number 1 game is another great strategy game. Star Wars: Rebellion is basically Star Wars in a box, allowing you to play through the events of episodes 4 to 6. The core of the game is basically hide and seek, with the Empire player trying to hunt down and destroy the rebel base whilst the Rebel player attempts to keep their base hidden whilst fomenting further rebellion across the galaxy. Along the way, ships and troops are built and moved around, alliances are made, planets are conquered, battles are fought, and heroes are recruited. These heroes or leaders are a huge part of the game – and certainly the most interesting part for me. Sending your characters out on missions is the most engaging part of the whole experience – whether those missions are based around combat, espionage, diplomacy or logistics. I love the way that this works, with heroes becoming your primary resource to be managed. Do you send them on missions, have them commanding the movement of your fleets, instruct them to lead fleets and armies into battle or keep them in reserve to counter enemy missions? The game is utterly asymmetrical, with very different games depending on what side you take. The game does a good job of making the Rebel player feel outnumbered and hunted, but still frustrating the Empire player as he searches planet after planet for that elusive base. Every game I’ve played has gone very differently and there are loads of opportunities for grand strategy. I’ve managed to get a lot of games of this over the few months I’ve had it, and I was really surprised and delighted that my wife took to it as well, as she doesn’t tend to like bigger strategy games. This is my favourite game at the moment and is well deserving of the number 1 slot in this year’s list. Codenames happens to be one of the games that gets played the most at our social events – Highly entertaining game. Great list 🙂 Have to admit: Not seen that Star Wars game before!